Bristol airport runway is closed this morning due to snow clearing operations and is expected to remain closed until 1200hrs. 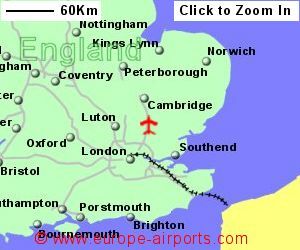 London Stansted Airport is located 48Km North East of London, close to the M11 motorway. Stansted airport has one terminal building, which was extended in 2008, however permission was granted in 2017 to build a new arrivals terminal alongside the current building. There is a railway station under the terminal building at Stansted airport with the Stansted Express departing every 15 minutes during the day, taking around 45 minutes to get to London - other trains also run. A number of bus services run between the airport and London or other areas. National Express run a service to other London airports, Liverpool St station (8 pounds), Victoria (10 pounds), Ipswich, Colchester and Braintree amongst other locations. Easybus run a service to Baker Street every 15 minutes at busy times with a 75 minute journey. Stansted airport has 21 bars/cafes/restaurants, 28 shops, luggage lockers, 6 Internet access and printing points and free (for 4 hrs) Wireless Internet Access. The gates are some distance from the departure lounge (via light rail link) and extra time may be necessary. The Radisson Blue Hotel is connected to the terminal building by a 2min covered walkway. A Hilton hotel is located near the Long Stay car park. 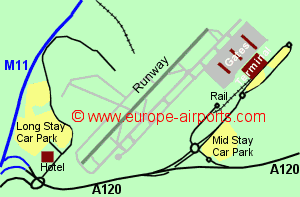 Stansted airport has Airport Carbon Accreditation, at the Neutrality level. During 2017, Stansted airport handled 25.9 million passengers, an increase of 6% from the previous year, and the busiest year yet, making it the UK's 4th busiest airport.